Among all solutions for disrupted vortex formation in shaft spillways, an innovative one called Circular Piano Key Spillway, based upon piano key weir principles, has been experimented less. In this study, the potential of Artificial Neural Networks (ANN) in estimating the amounts of discharge coefficient of Circular Piano Key Spillway has been evaluated. In order to pursue this purpose, the results of some physical experiments were used. These experiments have been conducted in the hydraulic laboratory using different physical models of Circular Piano Key Spillway including three models with different angles of 45, 60 and 90 degrees. Data from those experiments were used in training and test steps of ANN models. Multilayer Perceptron (MLP) network with Levenberg-Marquardt backpropagation algorithm was used. The performance of artificial neural network was measured by these statistical indicators: coefficient of determination (R2), mean absolute error (MAE), root mean square error (RMSE) and mean absolute percentage error (MAPE) and optimum quantities of statistical indicators for test step were assessed 0.9999, 0.4988, 0.5963 and 0.9999 respectively, for Circular Piano Key Spillway with an angle of 90 degree and for training step were assessed 0.9999, 0.5479, 0.6305 and 0.9999 respectively, for Circular Piano Key Spillway with an angle of 90 degree. In other words, Circular Piano Key Spillway with an angle of 90 degrees has the optimum performance, both in training and test steps. Artificial Neural Network model can successfully estimate the amounts of discharge coefficient of Circular Piano Key Spillway. Lempérière F, Ouamane A. The Piano Keys weir: A new cost-effective solution for spillways. Int J Hydropower Dams 2003;10:144–9. Lempérière F, Vigny J., Ouamane A. General comments on Labyrinths and Piano KeyWeirs: The past and present. Proc Int Conf Labyrinth Piano Key Weirs - PKW2011, London: Taylor & Francis; 2011, p. 17–24. Ouamane A. Nine years of study of the Piano KeyWeir in the university laboratory of Biskra “lessons and reflections.” Proc Int Conf Labyrinth Piano Key Weirs - PKW2011, London: Taylor & Francis; 2011, p. 51–8. Noui A, Ouamane A. Study of optimization of the Piano KeyWeir. Proc Int Conf Labyrinth Piano Key Weirs - PKW2011, London: Taylor & Francis; 2011, p. 175–82. Lempérière F, Vigny J. General comments on Labyrinth and Piano Key Weirs: The future. Proc Int Conf Labyrinth Piano Key Weirs - PKW2011, London: Taylor & Francis; 2011, p. 289–94. Barcouda M, Cazaillet O, Cochet P, Jones BA, Lacroix S, Laugier F, et al. Cost effective increase in storage and safety of most dams using fusegates or PK Weirs. 22nd ICOLD Congr, vol. 22, 2006, p. 1289–326. Cicero GM, Barcouda M, Luck M. Study of a piano key morning glory to increase the spillway capacity of the Bage dam. Proc Int Conf Labyrinth Piano Key Weirs - PKW2011, London: Taylor & Francis; 2011, p. 81–6. Ackers JC, Bennett FCJ, Scott TA, Karunaratne G. Raising the bellmouth spillway at Black Esk reservoir using Piano Key Weirs. Proc 2nd Int Work Labyrinth Piano Key Weirs - PKW2013, 2013, p. 235–42. Ancell W. Black Esk Reservoir Dam Raising. UK Water Proj 2013, Water Treat Supply 2013:295–7. Shemshi R, Kabiri-Samani A. Swirling flow at vertical shaft spillways with circular piano-key inlets. J Hydraul Res 2017;55:248–58. doi:10.1080/00221686.2016.1238015. Heydari M, Olyaie E, Mohebzadeh H. Development of a Neural Network Technique for Prediction of Water Quality Parameters in the Delaware River , Pennsylvania. Middle-East J Sci Res 2013;13:1367–76. doi:10.5829/idosi.mejsr.2013.13.10.1238. Harandizadeh H, Toufigh MM, Toufigh V. DIFFERENT NEURAL NETWORKS AND MODAL TREE METHOD FOR PREDICTING ULTIMATE BEARING CAPACITY. Int J Optim Civ Eng 2018;8:311–28. Khademi F, Behfarnia K. Evaluation of Concrete Compressive Strength Using Artificial Neural Network and Multiple Linear Regression Models. Int J Optim Civ Eng 2016;6:423–32. Keshavarz Z, Torkian H. Application of ANN and ANFIS Models in Determining Compressive Strength of Concrete. J Soft Comput Civ Eng 2018;2:62–70. doi:10.22115/SCCE.2018.51114. Naderpour H, Rafiean AH, Fakharian P. Compressive strength prediction of environmentally friendly concrete using artificial neural networks. J Build Eng 2018;16:213–9. doi:10.1016/j.jobe.2018.01.007. Kamanbedast AA. The investigation of discharge coefficient for the morning glory spillway using artificial neural network. World Appl Sci J 2012;17:913–8. Bashiri Atrabi H, Dewals B, Pirotton M, Archambeau P, Erpicum S. Towards a New Design Equation for Piano Key Weirs Discharge Capacity. Proc 6th Int Symp Hydraul Struct 2016;3310628160:40–9. doi:10.15142/T3310628160853. Khademi F, Akbari M, Jamal SMM. Prediction of Compressive Strength of Concrete by Data-Driven Models. I-Manager’s J Civ Eng 2015;5:16. 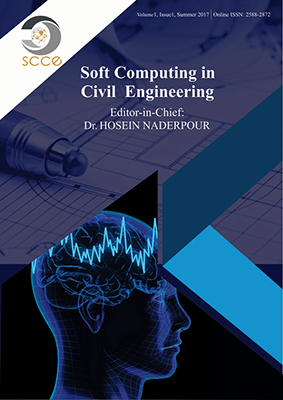 Haghiabi AH, Parsaie A, Ememgholizadeh S. Prediction of discharge coefficient of triangular labyrinth weirs using Adaptive Neuro Fuzzy Inference System. Alexandria Eng J 2016. doi:10.1016/j.aej.2017.05.005. Salmasi F, Yildirim G, Masoodi A, Parsamehr P. Predicting discharge coefficient of compound broad-crested weir by using genetic programming (GP) and artificial neural network (ANN) techniques. Arab J Geosci 2013;6:2709–17. doi:10.1007/s12517-012-0540-7. Behfarnia K, Khademi F. A comprehensive study on the concrete compressive strength estimation using artificial neural network and adaptive neuro-fuzzy inference system. Int J Optim Civ Eng 2017;7:71–80. Honar T, Tarazkar M, Tarazkar M. Estimating discharge coefficient of side weirs using ANFIS. J Water Soil Conserv 2010;17:169–76.